The last but not the least and the twelve placed of the senator re-elect for 2016 polls vowed to fight the return of the 'death penalty' proposed by presumptive president Rodrigo Duterte. Senatorial candidate Leila de Lima believe that there's other solution aside from capital punishment. Yesterday, May 16, presidential front runner revealed that the reviving of the 'death penalty' is part of his war on crime including also the 2:00am curfew on drinking in public places and a ban on children walking on the streets alone late at night. But according to De Lima on Monday that she vowed to continue opposing any move to re-impose death penalty. She said, "I do believe that that is not the solution. The solution is to fix the justice system. The new executive should start with the strict and faithful enforcement of laws," on her interviewed in the sideline of the book launch of former Immigration commissioner Siegfred Mison. The former chief of the Commission on Human Rights was asked about her stand on Duterte's administration and she said, "Let us observe the new leadership first. Let’s see and find out what his domestic and foreign policies. Let’s see. I just hope that he would always at all times uphold the Constitution, the rule of law and human rights." Meanwhile, the presumptive president is also asking the authorities to submit their 'Order of Battle,' or list of drug pushers and other criminals who are wanted by law enforcers. He said those on the list will be hunted down. 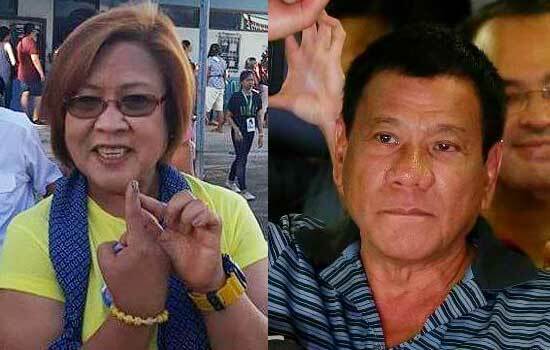 He said, "I said if you resist arrest tapos you offer a violent resistance, my order to the police or the military is to shoot-to-kill"
What do you think on Leila de Lima's promise against death penalty? Please point out your thoughts in the comment section below. Comments or suggestions about "Leila De Lima against on Death Penalty: 'The solution is to fix the justice system'" is important to us, you may share it by using the comment box below.